Cat toilet training kits are one of the biggest trends that are coming to the cat rearing and cat-owning world. Understandably so because flushing a toilet is way easier than cleaning a litter box and living in a stinky house full of poop and pee. Why litter box train a cat when you can just train him to be able to use a toilet and all you need to do is flush and some wiping every once in a while in case of an accident right? Unless you are some sadistic person who would rather see yourself chasing after cat poop in litter clumps living in a pee smelling house. 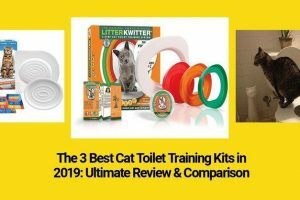 Before we start, we will first discuss why the simple act of toilet training of cats is a huge act of behavioral reconstruction, this way we can better understand the different methods employed by what we consider as the top three best cat toilet training kits of 2018. Perhaps ever? We will talk about their strengths and their weaknesses and ultimately, who wins the battle. That is why when our modern house cats poop they also try to cover it up with the litter that we provide them. When our cats also pee they use it as a method to mark their territory and as a way to announce that they own a certain area and that they rule that domain. But since they are now part of our loving and secure households, they need not fear predators and hunters to stalk them and do harm to them. Our cats also don’t need to pee all over the house because our house is theirs. Knowing that they do not really need this ancient hunting techniques and that ultimately it is detrimental to our health and their hygiene, we need to reconstruct this behavior and train our cats to pee and poop in the toilet. This training is hard in and of itself, which is why we need tools, systems, and kits that would make the behavior reconstruction easier for us and our cats. Then comes three of the possibly the most life-changing cat toilet seat training system in the market today. The Kitty’s Loo Cat Toilet Training Kit/Seat, the Litter Kwitter Toilet Training System, and the CitiKitty Toilet Training Kit. Before we discuss them, let’s talk first about the disadvantages and advantages of toilet training your cats. Let us face it, even the biggest cat lovers and cat owners hate dealing with dirty litter boxes. We love our cats but when we need to scoop out the poop and clean out the litter if it is washable and then replace it that is not a happy chore. If our cat is sick or has diarrhea and we have to clean the litter, nobody loves that. Nobody admits it because we think it is the same as not loving our cats, but it is perfectly normal people do not like dealing with actual poop. Toilet trained cat members of the family mean we do not have to keep and maintain litter boxes and scoop clumped up cat poop anymore. No more litter box simply means we do not have to deal with litter anymore. Litter has this annoying habit of being everywhere and turning up in the most obscure of places. You see them in the edge of the sofa, corners of the bed, insides of the pillowcase, you step on a tracked litter anywhere in the house and you end up wondering if that is clean or not and you go and wash your feet and find a couple in your shoes. Litters are annoying… Imagine seeing a litter on a cupcake? You will end up paranoid and think how it got there in the first place, is it even clean or what are you going to do about the 11 other cupcakes in the dozen who did not have an errant litter on them but you are now too scared to eat it thinking that there could be one stuck there. Right? 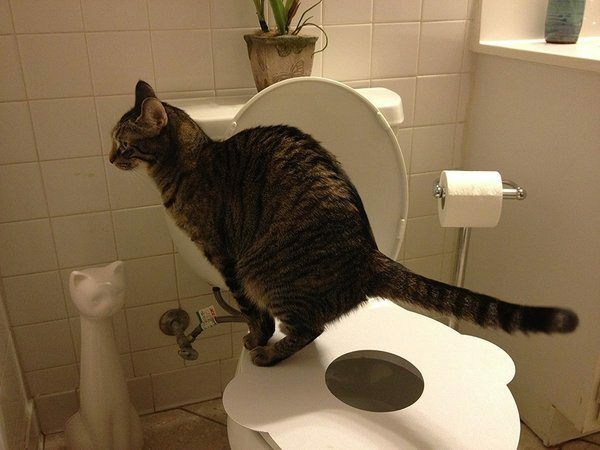 When your cat is already toilet trained, you would not even have to think about having a litter in the house. Just go and flush the toilet every once in a while. No more litter boxes and expensive litters mean tons of savings on your expenses for disinfectants and actual litter. Especially if you are using the automated self-cleaning litter boxes where every pop of those self-cleaning formula means additional notches on our credit cards. Have you seen or checked the cost of litter lately? Multiply that how many times you buy a sack per year and you can see that this thing’s cost pile up. Having no more litter boxes means no more litter and that can be a great cost effective way of saving money. You can use the money that you save to buy more food or toys for your cats, or better yet to build them their own toilet. Let us face it, a house that has full of cats is a house that is going to smell more or less smell funky or familiar. That familiar hint of cat poop and cat pee will always be hanging in the air when this happens. Having toilet trained cats in the house reduces the possibility of bad smell and bad odor in the house. It is just like having toilet trained babies in the house, the joys – I can imagine – are more or less the same considering that it helps a lot in terms of hygiene and odor reduction. Even the best self-cleaning litter boxes are at the end of the day, litter boxes. 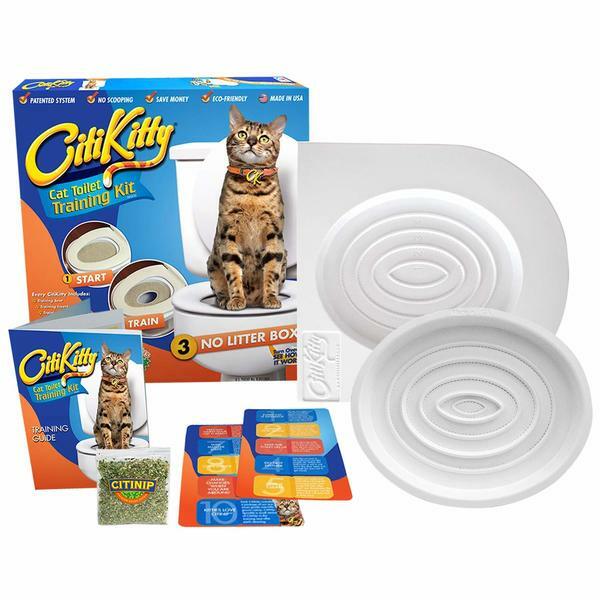 Removing the whole litter and litter box from the equation, through the use of the CitiKitty Toilet Training Kit simply means no more smell and better hygiene for everyone. Cat poop can become a serious health threat to us humans because some cats unknowingly carry a parasite called Toxoplasma gondii. These parasites shed what is called as oocysts, in their poop. These oocysts when transmitted to human beings, can cause various health issues and have been recently related to different mental health problems, including schizophrenia. In fact, recent studies suggest that some school-age children who have tested positive for the presence of T. gondii have problems learning in school. These are just some of the health issues that could arise if we miss one step with our cat feces cleaning rituals. That is why it is much better to have a toilet trained cat so would not have to expose yourself to health issues not just for ourselves but for our cat family also. I can’t even begin to describe the surprise and amazement that guest and visitors in our see whenever they see cats peeing or pooping in the toilet. It becomes an instant novelty story and can be quite a pleasant surprise for our friends and family. Instagram and Facebook posts would usually follow a cat caught peeing and pooping in the toilet. 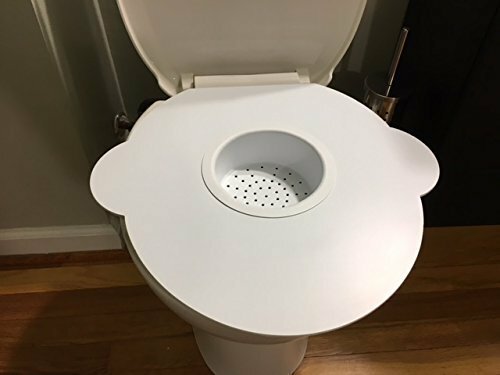 The CitiKitty Toilet Training Kit is a training seat that fit all types of the regular human toilet from the round to the oblong shaped ones, in different sizes. The CitiKitty Toilet Training Kit is made from hard, high-grade plastic, which can accommodate the weight of heavy cats. 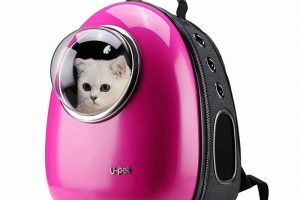 It is also designed if you have multiple cats at home, or even kittens no more than 3-months old. The CitiKitty Training Kit is 15.5 inches in length and 15 inches in width and 1.2 inches high. The CitiKitty uses a “disappearing litter box technique” to try and modify the behavior of cats into thinking that they are peeing and pooping in their regular litter box until they graduate and get used to the idea of doing it in the toilet. Basically the “disappearing litter box technique” means you gradually cut out the center until you reach the outer parts and your cats get comfortable with the idea of just sitting on the toilet. The CitiKitty employs this technique both for comfort and aim training of the cats, to make sure that they “hit their mark” and have no “accidents” where it can’t be flushed. The Litter Kwitter Toilet Training System is made of high-grade plastic designed to carry and support large and heavy cats. It comes in at 3.2 inches high, 15.8 inches long and 15.8 inches wide and weighs around 1.4 pounds. 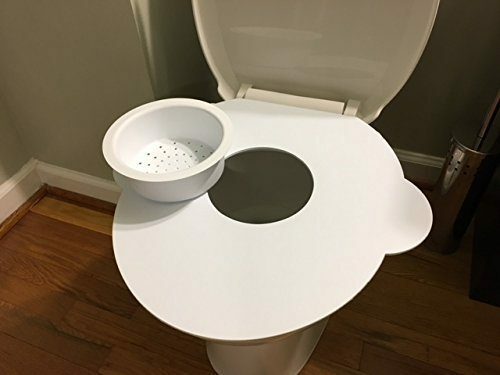 Just like the CitiKitty, the outside part of the Litter Kwitter is basically a cat seat that would fit around most standard toilet seats in the market today. It has color-coded detachable toilet rings that you can add and remove depending on your cat’s progression during his toilet training. The Litter Kwitter Toilet Training System claims that is was developed in coordination with animal behaviorists, veterinarians, and cat breeders. While the CitiKitty uses the “disappearing litter box technique” in cat toilet training, the Litter Kwitter Toilet Training System employs a three-step training system. 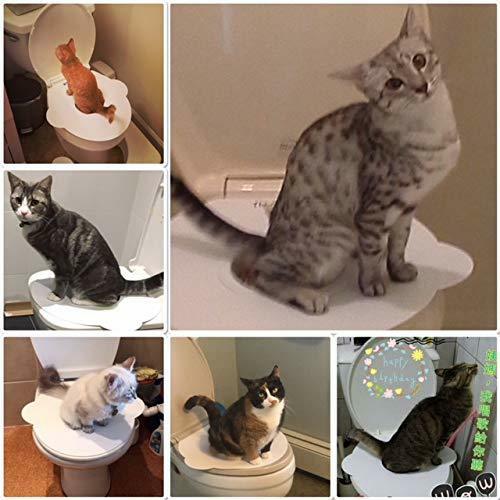 The three-stage of behavior modification in toilet training employed by Litter Kwitter focuses on teaching cats how to balance on the toilet or finding what is comfortable for them, teaching cats how to aim properly, and transitioning to pooping and peeing in the toilet independent of the Litter Kwitter system. What is noticeable with the Litter Kwitter is that it comes with a barrage of information dissemination system composed of a training DVD and a full-color instruction book that not only serves as a guide for the cats but more so for us cat owners imparting to us the importance of our actions, support, roles and our responsibilities in the toilet training process. The Kitty’s Loo Cat Toilet Training Kit/Seat is probably the most unique among the three in this list because not only does it employ a different method altogether because it is a sit, that your cat uses and not a system that they later on the transition from. It has its good and bad side, which we will discuss later. The Kitty’s Loo Training Seat is made of hard ABS plastic, and like the other two in this list, it is designed to carry the weight of even bigger cats. It is probably the studies in the group. It has a platform seat and a litter bowl designed to reduce the amount of tracking. 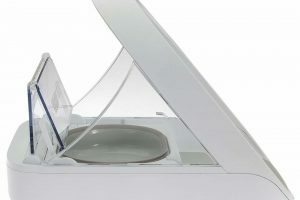 Like all its competitors here, the Kitty’s Loo Training Seat is also designed to fit all types of toilet, the round, oblong and even the square ones designed for floor installations. It is probably also the most versatile and adaptable here. It comes in at 15 ½ inches in width, 2 inches high and approximately 17 inches long. 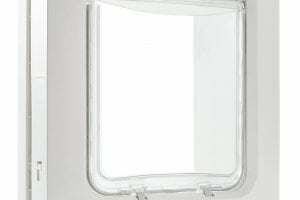 Because it is made out of heavy duty ABS plastic, it is a little bit heavy side weighing more or less 1.5 pounds. No doubt the three listed here are very, very effective as evidenced by the barrage of supportive reviews and positive outputs online but the user experience can be quite different with each system and with each kit. We also have to factor in the different cat mentality and psychologically state plus the training involved that is different with each cat and with each household that employs it. We’ve already touched on the CitiKitty and the Litter Kwitter systems above and what method they use. While the CitiKitty uses the disappearing litter box technique and the Litter Kwitter uses the three stages approach, the Kitty’s Loo is quite different, it is possibly the most unique of the three considering that it is, for all intents and purposes an adapter. All the other two cat toilet training systems are designed for cats to transition off of them later on with no more usage, but the Kitty’s Loo would require you to retain it. This makes it easier for cats to be more comfortable and more familiar with the system itself. It can be a different experience for the owner though, after all, we are sharing toilets with our cats now that they are toilet trained. The hardest probably with the Kitty’s Loo is the fact that you have to explain the thing to relatives and friends who are taken aback by it when they try and use your toilets and see the contraption for the first time. Some cats also do not know how to use the toilet if the Kitty’s Loo is not installed which might cause “accidents” when you inadvertently leave it off and go out to work or be away from home. Being the most inexpensive of the bunch and one of the most popular of the three we can see where the appeal CitiKitty’s appeal come from. It is fast, easy to use and there is no really much fuss about it. They call it a disappearing litter box system box you trick your cat into thinking that he or she is still using the same litter box, but in reality, you are really slowly removing the actual litter box by cutting out the middle. The CitiKitty Toilet Training Kit is basically a single use and throwaway system, you literally get a single reset on the system with the plastic attachment that comes with it. 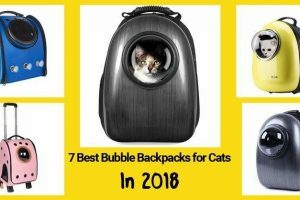 The CityKitty gained fame when it was featured it the famous television show, “Shark Tank.” The CitiKitty literally broke the program when its episode aired, it became an online hotcake overnight on Amazon under its Home and Garden Department. This was historical because no other upstart company has ever done this, most Amazon products under the Home and Garden Department are already hugely popular and backed by big marketing stunts and gimmicks from equally big marketing firms. The CitiKitty Toilet Training Kit has a reputation for simplicity and a reputation for effectivity. 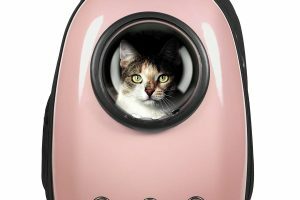 The owner and inventor of Rebecca Rescate in an interview once said she conceptualized the design for CitiKitty after she moved into a cramped apartment and quickly realized that she had no space for her cat’s litter box, so she decided to toilet train her cat. The problem was, she could not find and “easy-to-use, cost-effective toilet training kit.” The internet is full of “homemade” and “Do It Yourself” concept projects for toilet training, basically what Rebecca Rescate did was come up with a system and a design to help cat owner’s toilet train their cats themselves at homes, thus creating the first CitiKitty Toilet Training Kit. We say “toilet training kit” because aside from the simple and effective design, one of the main reason behind the success of the CitiKitty is the training guide that comes with which like the system is easy to use and effective. If the CitiKitty is simple and effective, our experience with the Litter Kwitter Cat Toilet Training System is nothing but numbered and “idiot proof” to be honest. What Litter Kwitter did was take the simple and basic approach that CitiKitty employed, simplified it using basically the same principles and provided less avenue for intervention and work for the cat owners and also multiplying their opportunity to make and correct mistakes or simple “accidents.” With the CitiKitty you can only get one “Mulligan” or redo when your cat reverts or has accidents due to the make and just one insert per kit. But the Litter Kwitter has unlimited tries because the system allows for an easy snap on and snap off method. Plus, the learning and training materials that come with the Litter Kwitter is no joke. When we say, it is idiot proof, we meant it is idiot proof. Even the seat that you removed is color-coded to make understanding the instruction kit that comes along with it easier. Doogie Stuff Ltd., makers of the Litter Kwitter Toilet Training System explained that the secret behind their success is the development process that came along with the idea of the Litter Kwitter. 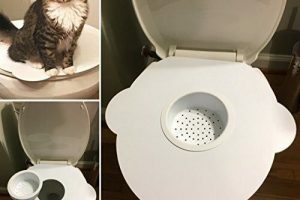 Basically, they saw something in the movie about a cat using the toilet and so they decided to come up with a system that would assist the cat owners as well as the cat themselves to transition from the litter box to the toilet. They took the expertise of veterinarians, animal behaviorist, and animal psychologist and cat breeders and combined their inputs to form the three-step training system that Litter Kwitter employs seamlessly. Where the CitiKitty failed in our experience is its inability to reset the cat’s learning experience whenever he reverts back to its last phase, the Litter Kwitter addresses simply, by making the removable toilet training wheels colored and able to be placed back on, a simple reversion in our cat’s mindset during toilet training can easily be addressed. 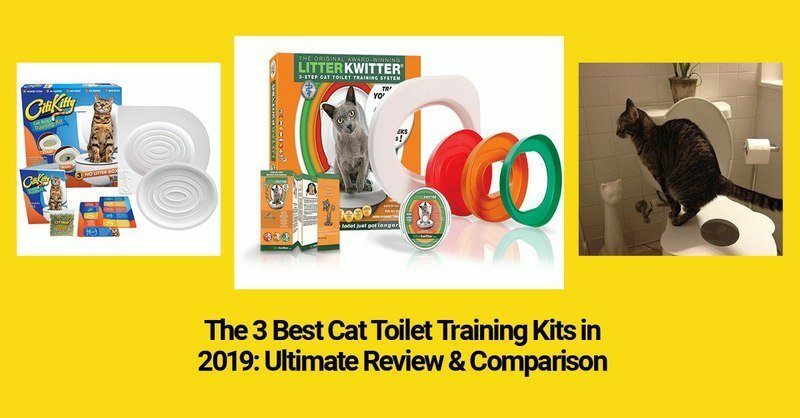 Curiously, while reviewing other user’s experience as part of this review we found out that cats tend to stay longer or the training time is longer on the Litter Kwitter Toilet Training System as opposed to the other two in here. For the CitiKitty’ “disappearing litter box technique” the cat has the tendency to be pushed into actual learning but the avenue for reversion and subsequent retraining is quite tight for the owners. Litter Kwitter conveniently takes care of that aspect of the cat owners problems. But like I said, it seems that the cat has the tendency to stay longer on one particular aspect of the three-part learning system. For example we found a user who had a problem with the second part of the three-stages particularly the aiming part, there would be times when they have successfully moved and stayed on the third stage only to have an “accident” and the cat has to go back to the second stage and stay there for months before moving up again. As of writing this review, they are on their second reversion on its third week now and staying there. A large part of this might just be the aches and issues that come with behavior modification that is inherently involved in toilet training. But even saying this, or highlighting this observation with the Litter Kwitter, it does not remove the fact that Litter Kwitter seems to have foreseen this possibility that addressing it is already incorporated into the design features of their toilet training kit. Plus, you can’t really fail with the Litter Kwitter considering all the is that it comes with a barrage of information that comes along with it like a training DVD and a full-color instruction book that not only serves as a guide for the cats but more so for us cat owners imparting to us the importance of our actions, support, roles and our responsibilities in the toilet training process. 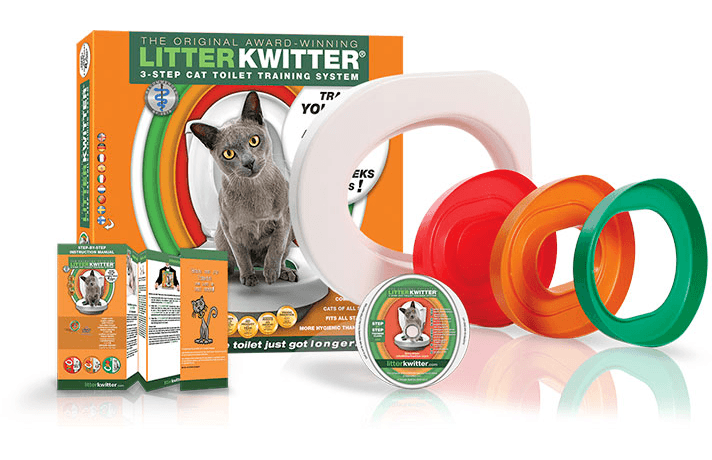 More about Litter Kwitter read in our big review “Litter Kwitter Review: Idiot Proof Toilet Training System for Cats”. Again, the CitiKitty uses the disappearing litter and the Litter Kwitter utilizes the three-stage method. The difference with the Kitty’s Loo is that it does nothing of the two. Instead of relying solely on behavioral reconstruction where the cat is taught to adjust to human tools and nothing more, Kitty’s Loo also helps the cat along the way by giving them sort of a human toilet adapter for cats for them to use. As an alternative to changing a cat’s behavior, Kitty’s Loo teaches the cat to sit not on a toilet, but on the special cover designed for them. How is this beneficial? 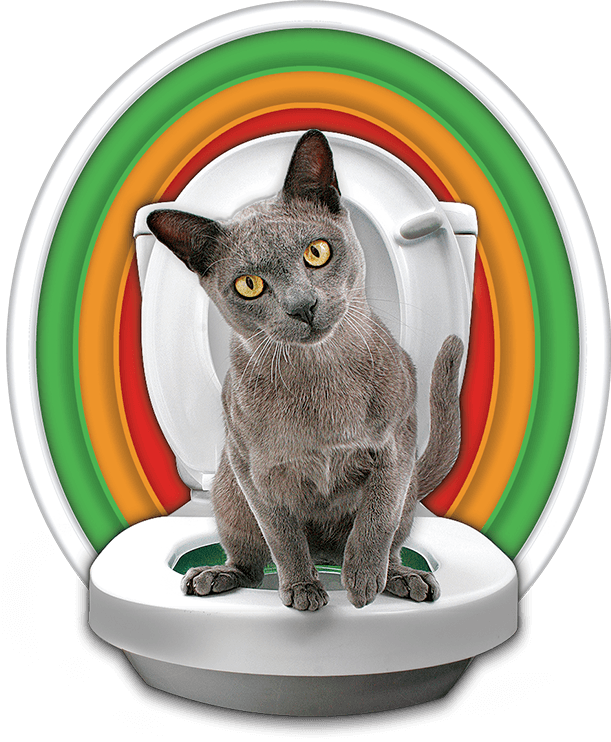 Generally, when we are using any cat toilet training kits or seats, generally when the cat’s transition to toilet use, one of the unspoken truths is unflushed cat poop and cat pee. A few special cats know how to flush toilets, and those that flush only know how to do it on specific types or kinds of flush, but most experience with any cat toilet training kit, the problem would always be the floating poop and pee mixed in water that has been sitting in the toilet for a while. While this is better coming home to as compared to a litter box full of poop and pee because you can just flush your toilet just like that. But make no mistake, it still stinks a bit that’s where the seat cover design of the Kitty’s Loo is beneficial. The Kitty’s Loo covers the whole toilet bowl, with a minimal hole in the middle so it stops stinky toilet water from evaporating and filling up the room when you come home. Plus it hides the unsightly thought of floating cat feces and yellow toilet water, you just have to condition yourself to flush the toilet before removing the cover and wash it as soon as you notice that it has been used by one of our feline loves. 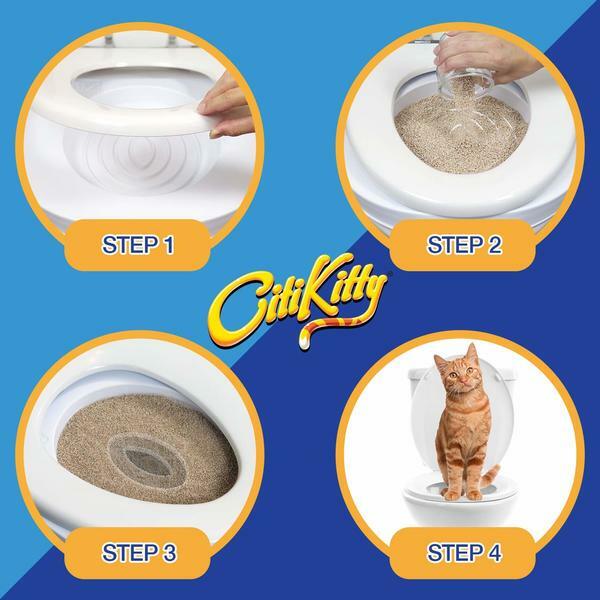 So after the long litany and the endless fussing over what is the best cat toilet training kit/system out there, what is the final verdict between the CitiKitty, Litter Kwitter, and Kitty’s Loo? These three are at the top of the game, no doubt about it. I do not think there is anything out there that would equal these three when it comes to cat toilet training kits out there. But our answer would perhaps disappoint you because, to be honest, you can’t single out one toilet training system out there without putting yourself at a disadvantage. It all is situational at the end of the day. If you are on a tight budget, living in a tight space, with very smart and non-finicky cats, the CitiKitty would be the best for you, no doubt. On the other hand, if you are the guy who is busy and just has enough spare time to focus on your cat’s toilet training, then the Litter Kwitter should be for you. However, if you are someone like me who only has one bathroom that I have to share with my cats and you have a cat that is fairly tolerant of transferring to a new litter box, then probably, the Kitty’s Loo is the best for you. Identify your needs, and base it on this comprehensive review and I am sure that you will have a feel as to what cat toilet training product works best for you and your feline family members. Oh and PS, the Kitty’s Loo is the best. Bye!